Glow Discharge Mass Spectrometry is a technique capable of providing trace-level elemental quantification for a wide variety of solid and powder materials. It is ideally suited for direct analysis of metals, semiconductors, and ceramic powders. In GD-MS, positive argon ions accelerate towards the sample resulting in erosion and atomization of the upper layers of the sample. Sputtered species then leave the cathode surface and are transported into the plasma to be ionized. 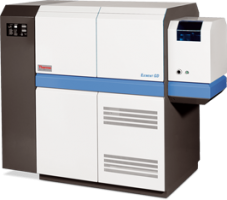 The GD-MS system from Thermo Scientific combines unique features, such as a µ-second pulsed, fast flow, high power glow discharge ion source, easy sample change-over for routine operation and high throughput, high mass resolution for interference-free analysis, fully automatic detection system with >12 orders of linear dynamic range and ability to determine matrix elements to ultra-traces within a single scan.